There are some mornings I want a cinnamon roll, but they take hours to make. 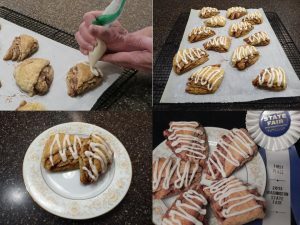 So, I created Cinnamon Roll Scones, which you can have in about an hour. 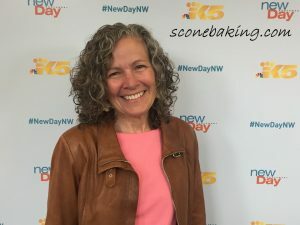 Not only do these scones look good, they are delicious. These are the scones most frequently requested by family, friends, and co-workers. 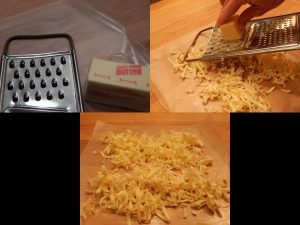 Grate butter and put in freezer. 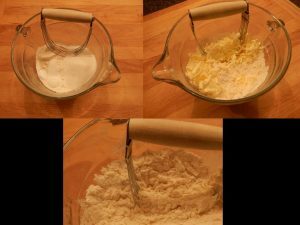 Meanwhile, in a large bowl, whisk together flours, sugar, baking powder, baking soda, and salt. 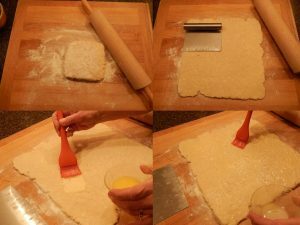 Using a pastry blender cut in frozen butter, until all the butter is covered with the flour mixture, leaving the butter in large, grated pieces. You can also just mix in the butter with a spatula. 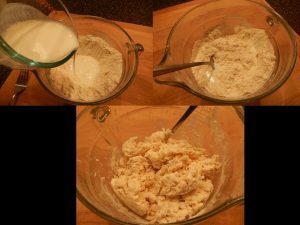 Make a well and add the buttermilk all at once, and mix until just together (do not overmix, the dough is very loose). 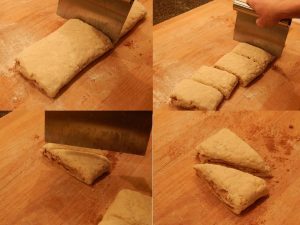 Place dough on a heavily floured board and pat into a square. 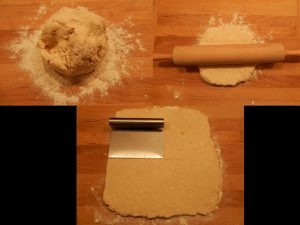 Roll dough into 12” square. Fold into thirds, and then fold into thirds the other direction (you should have a square again). Put on a floured plate and put into the freezer uncovered for 5 minutes. 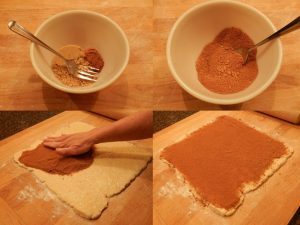 While dough is in the freezer, mix together the brown sugar and cinnamon, set aside. 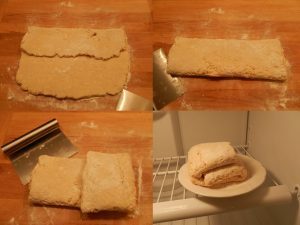 Take dough out of freezer and roll into 12” square. Brush dough with melted butter, covering the entire dough. 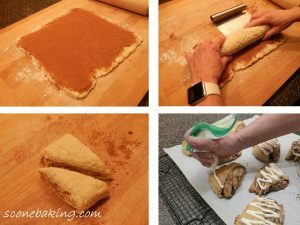 Sprinkle dough with brown sugar, cinnamon mixture, covering the entire area. 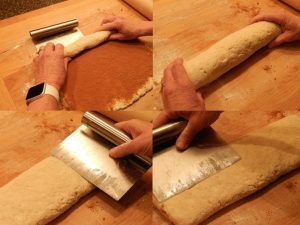 Roll dough like a cinnamon roll, into a tight log (do not make it so tight that the dough tears). Flatten log to 4” wide by 12” long. 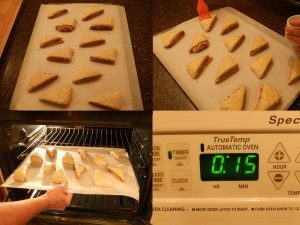 Cut flattened dough into 6 pieces (4” x 2”), then cut each piece on the diagonal. Place seam side down on a parchment covered cookie sheet. Brush tops with slightly beaten egg. Bake at 400 degrees F. for 15-18 minutes, or until golden brown & delicious. When done, slide scones with parchment paper onto cooling rack, set aside cookie sheet. When cooled, put scones, with parchment paper, back on cookie sheet. 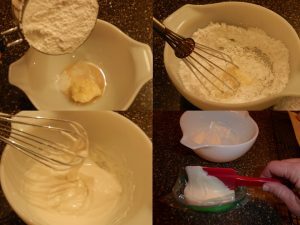 Combine softened butter, cream, vanilla and powdered sugar with a whisk, until smooth. Put icing into a ziplock bag, cut a hole in the corner and drizzle on scones.